Whether you’re a professional illustrator or just someone who likes to draw manga for passion, only the best drawing gear can guarantee a successful result. Many rookies believe that all it takes is a set of outstanding pens. But the substrate can also make or break the deal. If you want to achieve beautiful illustrations, then you need the best paper for manga. While the market is full of choices, finding the right sketchbook can be overwhelming if you don’t know what to look for. Paper comes in a variety of qualities for pens, pencils, watermark colors, and so on. Since the manga is usually drawn with alcohol markers, it’s a good idea to start your selection from there. Once you’ve narrowed down your search to paper suitable for markers, focus on the actual quality of the sheets. Check their grammage, and aim for at least 120gsm if you want to draw professionally. A lower weight may do for beginners, but the paper will not withstand too much ink. Another thing to consider is the texture of the paper. Smooth sheets are the best for manga, helping you achieve accurate lines and crisp details. You must also consider the format of the paper. Standard formats include A3 and A4, but you can use paper of any size. If you want to draw manga like a Japanese artist, know that their standard is B4, which is slightly bigger than 8.27 × 11.69 inches. Still overwhelmed and confused? Check out our selection of the best paper for manga drawings below. Decide you’re going to become a new age manga-ka instead? Check out these programs for drawing manga digitally! Finding outstanding paper for manga is far from easy, but ARTEZA lives up to the expectations. This hardbound sketchbook can satisfy pros and amateurs alike thanks to the 130gsm heavyweight paper. The fine tooth texture of the sheets is a further reason to nominate this the best paper for manga. You can create the finest details thanks to the smoothness of the pages, but these are not the only features we like. Another outstanding characteristic is the lay-flat design of the sketchbook, developed for stress-free sketching either on a desk or on your lap. A faux leather hardcover adds elegance, provides library-quality appearance, and protects your pages from creasing. Coming in a set of two and ideal to use with a variety of drawing media, this sketchbook is perfect for manga drawers, illustrators, and artists in general who want to express their artistic talent in their studio, at home, or on the go. The Strathmore Learn to Draw Manga Wire Pad is perfect for the aspiring artist who’d like to draw manga but has no clue on where to start from. Combining the utility of quality paper with the convenience of a step-by-step course, this wire pad includes manga drawing instructions from the popular illustrator Christopher Hart. The acid-free paper is perfect for use with dry media; weighing 106gsm, it may not withstand alcohol markers, but it’s amazing for kids and beginners. Another great feature is the attractive price tag. It’s hard to find a more cost-effective draw pad with step-by-step drawing instructions on the market, not to mention that it includes 30 valuable lessons. If that’s not enough, you’d like to know that by getting this booklet you’ll also gain access to a series of 10 video tutorials from the artist, for an even more intensive immersion in the manga drawing world. If you’re an established artist serious about your game, check out the Rendr Hardbound Sketchbook by Crescent Creative Products. This limited edition sketchbook is perfect for drawing manga as well as comic book illustrations. It comes with professional-grade 180gsm acid-free paper, and the no-show thru technology allows you to use both sides of each page so that you can easily maximize drawing space no matter what medium you use. Drawing with alcohol manga markers on these sheets is more than satisfying thanks to their smooth texture too. Sketching accurate details and crisp lines is a breeze, and so is achieving whatever intensity of color you wish to achieve. Like every artist who respects themselves, you probably care about details too. If that’s the case, know that you’ll never be ashamed to pull this sketchbook out of your drawer or bag. Quality hardbound and a soft-touch black cover give this pad a luxurious elegance. Manufactured in the USA and containing 48 pages, the Rendr might not be the cheapest but is undoubtedly one of the best sketchbooks for drawing manga. Despite the premium in its name, this Manga-Marker Paper Pad might not satisfy the professional artists. Yet, it’s clearly a great choice for amateurs and beginners. The only thing we like slightly less is the rather light paper, which only weighs 100gms. That’s hardly a drawback given that it seamlessly withstands ink, water, and permanent markers. Bleeding will never be an issue as long as you’ll keep using the suggested media, and a thing you’ll surely like is the smoothness of the paper. Another great thing is the affordable price. Coming in a set of two, this paper pad can make a great gift for a talented kid or even for adults who have just discovered a drawing passion. Ideal for mixed dry media and sketching, coming with pH-neutral natural white sheets, and at a price that won’t break the bank, this manga drawing paper is perfect for rookies, youngsters, and artists who like to work mainly in black ink. The Canson Comic Book Art Boards Pad is a superlative sketchbook able to satisfy even the most demanding artist. 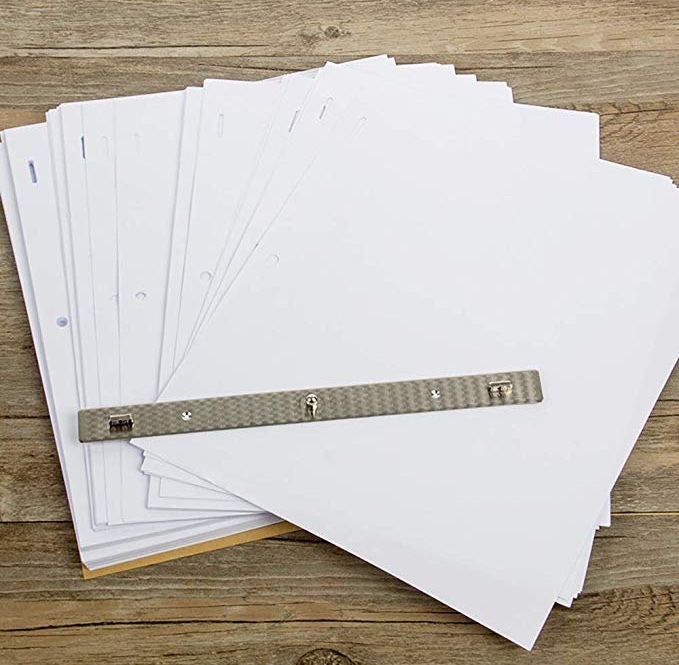 Its heavyweight 250gsm paper truly makes the difference between this pad and all others, while the 11 x 17-inch size of each sheet gives you plenty of drawing space. It’s easy to understand that such heavyweight paper resists erasing and scraping excellently, but this is not the only great feature you can expect. We like that it’s suitable to use with an array of fluid and dry media including manga markers, ink pens, as well as graphite, pastels, or pencils. Helping you take your manga drawing skills to the next level is also the smooth texture with preprinted blue lines. Designed specifically for professional artists, the lines fade out when scanning the artwork, while the cyan shade is easy to remove completely with image-editing software. Consisting of 24 sheets, this outstanding sketchbook also comes in a pack of two or three, so that you never run out of paper on those moments when you need it the most. 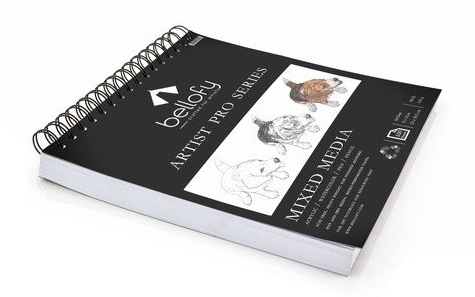 Another promising sketchpad manga artists swear by is the Bellofy 100-Sheet Sketchpad Artist Pro. We were impressed by its quality and truly liked the way it absorbs colors. Substantially reducing blotching, smudges, and accidents, this is one of the best papers for manga out there. If you’re essentially a manga artist but also like to focus on alternative art now and then, know that this sketchpad is manufactured for mixed media use. The premium surface of the sheets withstands almost all drawing mediums from dry to wet. Thanks to its superior bleed resistance, the paper is perfect to use with manga markers as well as ink pens and watercolors. A nice heft of 160gms and the 9 x 12 sheet size are other factors that make this paper ideal for manga. Furthermore, the spiral design and sleek softcover enhance this sketchbook’s aesthetics, so that you can feel proud each time you use it. The Bee Paper Bleedproof Marker Pack could be a great alternative if you’d rather use individual sheets instead of a sketchbook. This paper is perfect for manga and coming book illustrations, it’s easy to scan, and it can even pass through a printer if you’re thinking of transferring art lines onto it. The thing we like best is the manufacturer’s recommendation to use with Copic pens. This is a clear indication that it’s compatible with alcohol-based markers, although it performs wonderfully with a variety of other mediums including permanent and water-based markers, technical pens, and ink. Another thing we like is the beautiful natural white finish of the acid-free sheets. The ultra-smooth texture is another feature that makes this paper ideal for manga. You can draw crisp lines and details, layer colors, and fill in designs without worrying about smudges, bleeding, and unaesthetic accidents. Coming in a variety of pack and sheet sizes, the Bee Paper can easily satisfy beginners, established artists, and amateurs. Whether it’s manga or comic illustrations, the MyLifeUNIT Animation Paper makes drawing animation cells a breeze. It’s made from 70g wood pulp and has unrivaled transparency. One of the best features is the three-hole location design that gives you the possibility to use it with an animation peg bar. Its good deflection and tenacity keep all sheets stretched, preventing wrinkling. You’ll also like the uniform density that ensures an even smoothness on the entire page. Achieving accurate drawing is truly easy, and so is using the paper with an array of mixed media. Like most types of animation paper, the MyLifeUNIT is white and perfectly sized to fit into a scanner. Coming in a pack of 200 sheets and compatible with fixed paper feet produced by the same company, this paper for manga will undoubtedly help you give life to your artistic creations. More cost-effective than traditional comic book paper and coming straight from Japan, this paper from Deleter is an excellent choice for all manga enthusiasts. It comes in either 110 or 135gms, and a pack includes 40 sheets. Perfect for both seasoned artists and beginners, each sheet comes with scale marks including center registration, cutting, and edge registration marks designed to help you achieve accurate manga and comic illustrations. The smooth, fine-grained texture is another feature that makes it ideal for the purpose. Surpassing many American brands in terms of quality, these sheets are ideal for professional cartoonists and not only. Another thing we truly like is the attractive price point. It won’t cost you more than a sketchbook for kids but delivers all quality required by professional artists. Packing all you could wish from a top-in-class pick, this pack of manga drawing sheets truly deserves your attention. Another great alternative to the sketchbooks above is the Premium Pad by illo. It’s not designed specifically for manga but it’s perfect for the purpose, and even has the perfect backpack dimension. The feature we like best is the quality of the sheets. Counting 112 pages, the sketchbook contains 180gsm lay flat paper; just perfect for most art mediums, from manga markers and ink pens to watercolors or charcoal. Coming in three sizes, the sketchbook can also meet most needs. It is ideal for on-the-go drawing, either while commuting or during your outdoor adventures. A surprising feature is the perfect square design of the sheets. This is a rather peculiar characteristic, but the manufacturer had a good reason to opt for this format. Indeed, you won’t struggle with awkward image cropping when sharing your art on social media. Now, how clever is this? Made with high-quality materials and coming at a great price, this sketchbook fits most artists. As for the visuals, it’s hard not to like the soft-touch hardcover made from faux leather. Boasting a vegan-friendly design and packing a wealth of amazing features, this is the best paper for manga for social media addicts.